Felting Needle Studio Pack includes 15 great felting tools in one convenient pack! Felting needles for all of your needle felting needs. Includes our Single, Double & Quad Point Felting Needles! These were the first needles I bought to use needle felting. I got the complete sampler set, the a set of reverse, and a set of spiral needles. All of them feel REALLY sturdy. Especially compared to some needles I got at random craft stores which feel flimsy and are harder to hold. I use a lot of the needles interchangeably but they all have a distinct feel and manner in which they felt. This was the BEST CHOICE I EVER MADE getting these needles to start with! I don’t think I would have kept up with needle felting had I only been using the cheap store-bought needles. These are a must have for any level! I’m thinking about getting a set for my friend who tried needle felting but it never stuck. Great gift, great set, I expect them to last for a long time. Reviewed by: Chandra from Minnesota. on 9/21/2015. 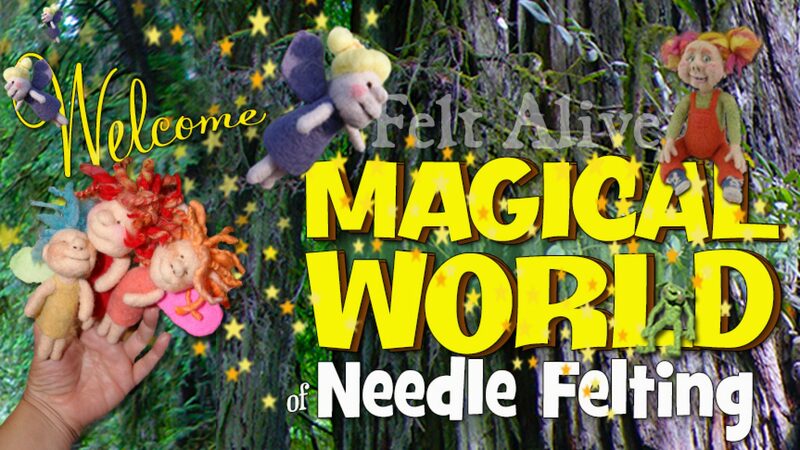 The Felting Needle Studio Pack has felting needles for all of your needle felting needs. For sculpting, flat felting embellishing, wool painting, working over wire, large projects, miniature projects. No matter where your needle felting journey leads, you’ll have the right tools to bring your ideas to life. Read more about the various uses of all of our felting needles here. I only recently discovered needle felting & was led to this site. These are great quality needles with comfortable handles & I’ve no doubt they contributed to making even my very first project a success. I’ll be a continuing customer here. Since I discovered Kay Petal’s felting needles,I only use them! They are great tools,handles are are perfect,I can felt for hours with them! My favorites! These needles are very nice. I particularly like the double and singles in red and yellow and the single in blue. I tend to use very soft fine roving (bamboo and merino blend) and these are great for that. Generally I make small items so the quads are a bit much, but I can definitely see where they would be handy for larger projects! The plastic makes them comfortable and reduces the slippage of needles without them. They also make it so you don’t have to grip the needles so tightly and I appreciate the reduced stress on my hands! I absolutely love this sampler pack. I had no idea what I was missing and how much easier it is to use these felting needles. I’ve used all of them to date and find that each has a specific purpose for me. From very fine detailing to attaching pieces. The unique rubber coating on the handle makes for less hand fatigue and safety, because of the sure grip. In addition, rubber coatings come in different colors, so it is easy to distinguish the type of needle to use. The needles are lovely to work with in hand and I enjoy the organization of the needles…easier than a circular arrangement in the quad. I highly recommend this grouping of needles for general dry felting sculptures. Thank you for this offering, I’m sure to get many hours of enjoyment with them! These are exactly what we were looking for to start with felting this holiday season. As a crafts person myself I respect those who take their skills to the next level. And even better to share this with others is amazing. Don’t shop around you found what you need here. I cant imagine felting without these…my arthritic hands just wouldn’t be able to do it. May I suggest you consider adding a spiral.. I love how they are colour coded and they are so comfortable to use. Thank you so much!! !